Despite extensive research, I can find very little information on this company anywhere except on the internet which has a few references indicating it is a small antiques business based in Camberley while other references refer to it as a model and promotionals maker. 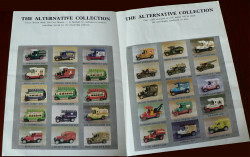 The Alternative Collection is a range of model vehicles primarily based on the Matchbox Models of Yesteryear castings. Each model appears to be issued as a limited edition of 1000 and comes with a certificate of authenticity plus some information on the subject of the model. The models are repackaged in their original manufacturer's packaging with only the addition of an end-tab sticker denoting the item belongs to "The Alternative Collection by Creaks of Camberley". Neil Cameron has advised Creaks of Camberley was a small company run by Eric Creak. 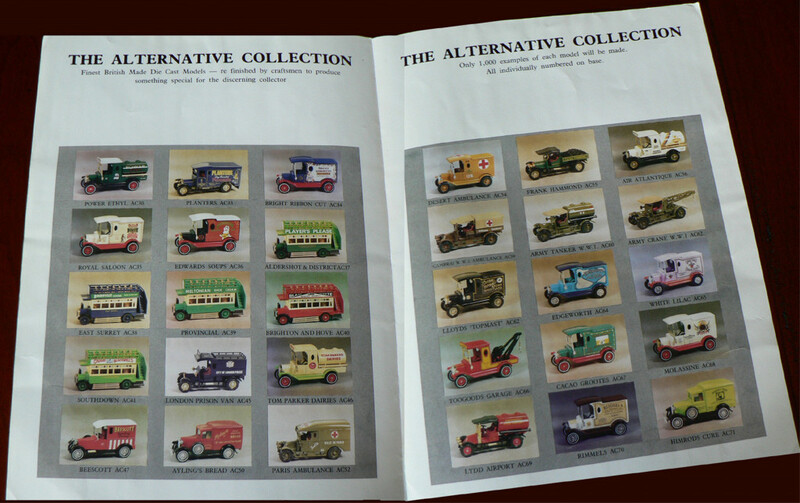 Eric specialised in converting Matchbox models, mainly into Police vehicles of yester-year, and called the series "The Alternate Collection". He also started to scratch build models and called this his "Peel Collection". There were about 15 models made in this latter series, starting with designation "PC1" which was a mounted policeman on his horse. The mailing address for Creaks of Camberley was PO Box 167, Camberley, Surrey, GU15 2AX, England. 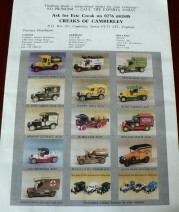 Ruud Kokke from The Netherlands has kindly provided the following photos of a catalogue in his possession. I have slightly edited them to make the originals all one height. Click on the smaller gallery photos to see a slightly larger version which can be expanded to full size. 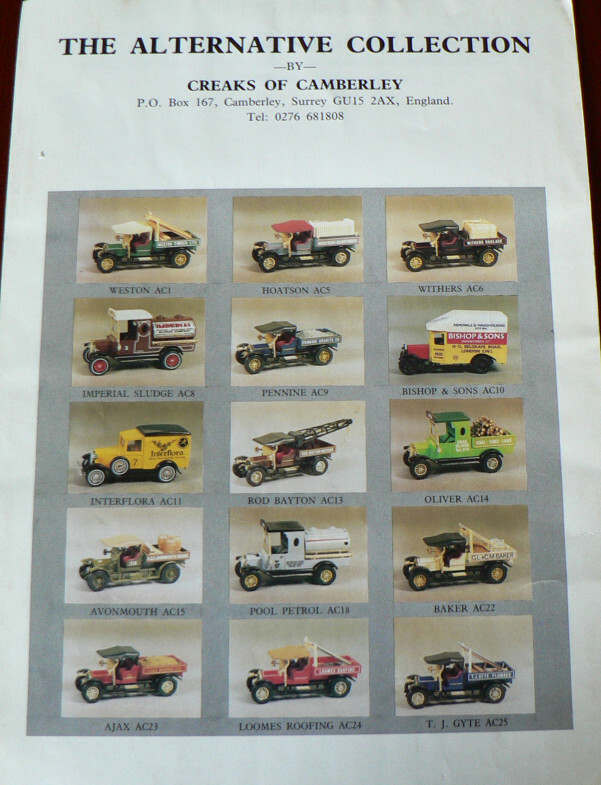 Gordon White has been in touch and has provided a large list of the models and several photos of the catalogues and news letters from Eric Creak, etc. I will upload these as soon as the server updates are completed and tested as working properly. To date I have been unable to locate any references or listings outlining the full extent of the range in this "Alternative Collection", examples of which appear, from time to time, on eBay. I understand from other collectors and searches of eBay listings that Creaks has probably produced over 100 different models for this "Alternative Collection" and an unknown quantity of models as promotional items for other companies. Eventually I will add further sub-pages to this entry detailing the models I have in my collection that have been produced by this company. 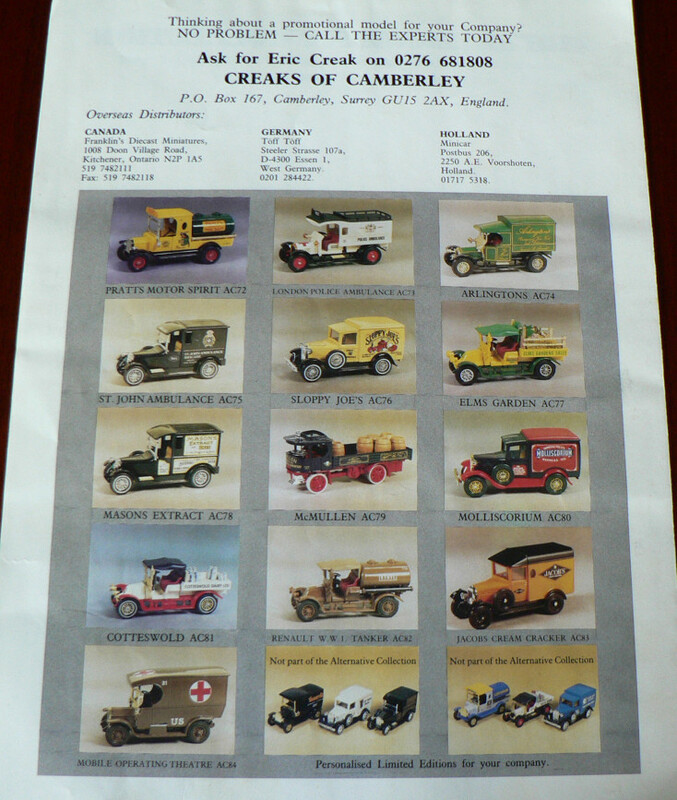 I have several Creaks of Camberley Police Models, all are Limited Editions of 1000, I also Have 12 Peel Collection Models 2 to 13, these were specialy produced a few are scratch built. I will email the Web Editor photographs of these models. Eric Creak no longer produces either The Alternate Collection or The Peel Collection, Ceaks of Camberley, have now ceased trading. As a retired Police Officer with Northamptonshire Police I was fortunate on many occasions to meet with Eric Creak during the 80s and 90s as a result of attending the famous toyfair, Farnham Swapmeet held at the Maltings, Farnham,Surrey some 3 - 4 times a year. I was responsible for commissioning the two Northamptonshire Polce models AC 101 Police Van and AC 130 Borough Police Ambulance. The first model was introduced to commemorate the 150th Anniversary of the force and monies raised was donated to various national charities. The second model raised monies, which were donated to the Multiple Sclerosis Society. I was an avid collector of the Police vehicles and was fortunate to acquire pre production models prior to final release. As previously stated by Neal, the Alternative Collection was limited to 1000 pieces only, each model numbered on the baseplate which corresponded with the numbered certificate of authenticity and each box carried a Creaks of Camberley label. As you are aware the Yesteryear Model was used for the production of the Alternative collection which then produced variations such as 12 / 24 spoke wheels, Renault / Crossley baseplates different coloured seats, wheels, Matchbox / Lesney baseplates and in the case of AC162 Reading Borough Police (Crossley) even black or grey canopies. Some certificates were personally signed such as the first 100 or 200 but the remainder were printed. The most sought after model in the collection of Police Vehicles will always be AC61 Liverpool Police MG as a result of being commissioned by a large Police Force and the models selling out very quickly. Even in the 80s this model would be 'changing hands' for a minimum price of £130 - £150!! Other models within the collection still remain rarer than others such as AC43 City of London Police Ambulance (Talbot) AC44 Manchester Police Ambulance (Talbot) and AC45 London Prison Van (Renault). Although each model was limited to a 1000 pieces (certificated) there may have been a very small number of additional models produced - known as overruns but these were never part of the original allocation and carried no number on the baseplate and NO certificate. If any collector should be offered models without a certificate and a model with no number DO NOT buy as they are part of the 'overrun'. As an example of an ebay dealer not knowing what he is selling - recently advertised was an AC130 Northamptonshire Borough Police Ambulance with NO certificate, model NOT numbered, the model having black wheels and a black roof( never existed in that colour). No wonder it was a so-called rare item but soon got withdrawn from sale following an email! !